Russian thistle, also known as tumbleweed, is a dense intricately-branched plant forming a round bushy clump one to three feet tall. Stems and branches vary in color from green to red, often with darker stripes. It has many rigid and spine-tipped, narrow, fleshy leaves and bracts, which are soft when young but become dry and brittle with age. The leaves grow one half to one inch long, with lower leaves as long as two and a half inches. Small inconspicuous flowers appear at the base of the leaves and look like papery saucers with a pink or reddish center. 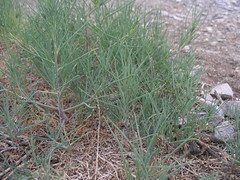 Russian thistle has a taproot descending five feet below the plant, in addition to horizontal roots spreading out about six feet around it. This long taproot can extract deep soil moisture that is not available to other plants. When Russian thistle plants die in the fall, they break off from their roots at the base of the stem. Their circular shape allows them to tumble freely in the wind, often for many miles, scattering seeds as they go. Large plants can produce up to 100,000 seeds, which can remain alive in the soil for one to three years. Plant “skeletons” (the part that tumbles) persist for at least one year and are typically found along fences and other structures. As a noxious weed, Russian thistle is not an aggressive competitor. It does not replace native species, but takes advantage of disturbed areas, such as along roadsides and fence lines and new structures. It does all its growing during late summer when the water supply has essentially been depleted, by combining efficiency in water retention, storage, and absorption. Russian thistle can be controlled by hand pulling, but that can be difficult given its spiny nature. Always wear gloves. Other methods of control are cutting, mowing, or tilling. Two insects have been approved for biological control. Controlling seedlings in the areas where the skeletons collect can be very effective.